The long-term success of virtually every business depends on strong, long-lasting relationships, and today that requires an effective Client Relationship Management (CRM) tool. Meet ClientBase, the industry’s leading CRM tool, designed specifically for travel agents’ needs. Use it to easily mine your agency’s most priceless information. Want to be known as the agent who automatically fine-tunes each trip to the client’s personal preferences? ClientBase gives you instant access to your clients’ profiles, including phone numbers, email addresses, past trip information, preferences, and more. Whether it’s a room away from the elevators, an aisle seat, or that annual vacation in the tropics, you’ll be able to capture and store pertinent info that helps you know each client inside-out, and the info will be just a click away. Use the info to build lasting relationships as clients return to the agent who knows them best. Use it, too, to gain the insight into your customers that will increase your marketing success. For pricing information, contact a ClientBase sales representative. Live Connect to third-party web-based booking engines to seamlessly pass agency login and client data to the supplier booking site. Live Connect can also import reservations from the booking engines back into customers’ profiles within ClientBase. View a demo of ClientBase. Contact your ClientBase sales representative for more details. 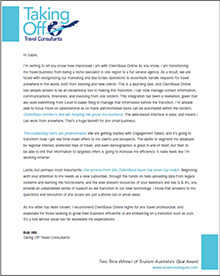 Read more on Taking Off Travel Consultant’s fantastic experience with ClientBase.